April is a busy month for birthdays. 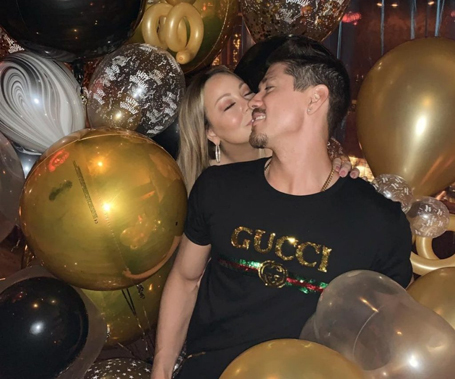 Mariah Carey's boyfriend and dancer, Bryan Tanaka, just celebrated his birthday yesterday alongside his lady. Viewers watched their romance blossom on the E! docu-series "Mariah's World" in 2016 and these two are still going strong. Carey who is typically private, when it comes to her dating life she is not shy about showing PDA online with her boyfriend of 3 years. Tanaka turned 36 years old in a big celebration on April 11, 2019. In a video posted to his official Instagram, you can hear Carey's voice in the background. "Tanaka is very excited tonight for his anniversary," she says. If you know MC, she always calls birthdays "anniversaries". He gave a public shoutout to Mimi for an amazing birthday. "Thank you babe for making my night so special. And thank you to everyone for all the birthday love and wishes." Mariah also shared a sweet photo from the night to her Instagram page. These two have birthday quite close to each other. Mariah just celebrated hers on March 27th turning 49 years old. "Don't be bleak, be festive," Tanaka's shirt reads. "Happy anniversary babe. I love you," the caption says. The couple who has fun together stays together. Just on St. Patty's Day, you can see a very festive and colorful celebration with balloons and costumes. If you look closely, you will see a rare no makeup, fresh-faced Carey posing for the shot as her boyfriend gives her a kiss on the cheek. The couple has been on their Caution World Tour North America since late February. They are currently on a short break before heading overseas to Dublin on May 22, 2019 for their Caution Tour 2019 Europe and UK until mid-July.